My usual online shopping routine goes like this; "I love that!" *clicks on the product link* "Yeah, I really want it! *Clicks 'add to bag'* "I'll go to check out in a minute". Three hours later and the item has disappeared out of my shopping bag and out of my memory. But that's not the case with these gorgeous little things. Saddle bags and tassel detailing has been around for a couple of seasons, predominately the sadly departed spring/summer, so you may be over it. But the choice of colours (Oxblood is my favourite - the colour is a hot this season), the quality of the product and the subtle yet refreshing hard wear brings these Topshop bags into this new season with a new lease of life! It's safe to say I'm obsessed. I'm close to buying one in every colour and at £30 each it's justifiable (almost). Come to Muma! These are gorgeous, and look quite similar to the Chloe bags! The brown or black would be such a good everyday staple. Love this bag - I saw it in Topshop recently and was drooling! 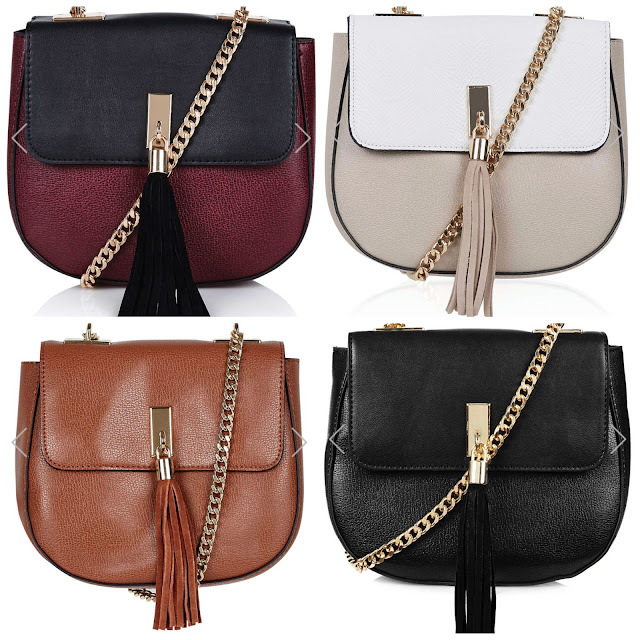 These bags are absolutely gorgeous - I love the brown offering!